A CLASSIC STORY FOR CHILDREN TO COLOR! 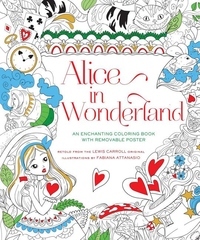 Kids can bring their favorite tales and characters to life through the magic of coloring. This enchanting retelling of Alice in Wonderland will stimulate children's creativity as they put their own mark on Fabiana Attanasio's illustrations and make every page unique. Young readers will also the enjoy adaptation of the original story, retold in fresh and modern language. Plus, there's a removable poster to color in and hang on the wall--so budding artists can admire their beautiful work.